To introduce fans and future Star Wars park visitors to the stories of Galaxy's Edge, Lucasfilm and Marvel are bringing out comic books and novels set in the fictional/theme park place. In April, a comic book mini-series called Star Wars: Galaxy's Edge begins with the story of Dok-Ondar, "a proprietor of rare and one-of-a-kind antiquities," and the strange characters who seek out the Ithorian trader. It makes be believe we will meet Dok-Ondar in the park where he will have the coolest in-universe gift shop. 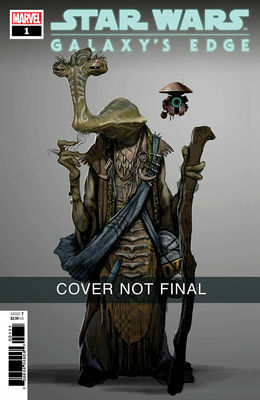 The tentative cover of issue #1 of comic book mini-series "Star Wars: Galaxy's Edge" featuring Ithorian trader Dok-Ondar, available April 24. Image by Lucasfilm/Marvel. In September, Del Rey books is releasing a new novel by Delilah Dawson called Black Spire, in which General Leia sends someone to find Resistance allies on Batuu. This would put the first mention of Galaxy's Edge around The Force Awakens timeline. I wonder if this is the story that puts the Millennium Falcon in its park location? In any case, it should be a fascinating story. Two novels arrive in August: A Crash of Fate , a young adult novel by Zoraida Córdova, which tells the story of two young friends reuniting on Batuu, and Myths and Fables by George Mann, which chronicles some legends from the Outer Rim, including Batuu. An excerpt from Myths and Fables and more information on the books is available here. A few more details are here. Some people did not like The Last Jedi, some did not like Solo... well, that’s OK, some people didn’t like The Phantom Menace. Not liking something about Star Wars is not a new thing. For all the displeasure expressed online, there are far greater numbers who just love Star Wars, who enjoy discussing it, and who do not delve into bleak negativity. They, like me, would rather talk about interweaving stories and character arcs and all the scenes that amazed us than bicker about some part we found objectionable and condemn anyone who disagrees. It is much more fulfilling to be positive about what we love and build each other up in our fandom rather than to wallow in pessimism and break each other down. Let’s keep a little optimism. Turn from the negativity. Remember what we love about this imaginitive fictional galaxy: heroes, adventure, morality, fantasy. And... fun! It just so happens that Star Wars also has valid mythological perspectives. There are deeper meanings behind all the laser blasts and lightsabers. These ideas have been discussed a great deal ever since the original trilogy. I've done quite a bit of it myself. We talk about what it means to fight evil in the world and within ourselves. I always find it fascinating and I pick up a little something new almost every time I watch one of the movies. And yet, I don’t usually pop in the movie for exestential contemplation. I watch it because it’s fun. It makes me happy to watch a Star Wars movie—all of them! Any of them! With all the characters and scenes that cause smiling to turn to beaming, and snickering to out-loud laughing, I forget why we fight in the first place. Arguments are part of fandom, yes, but I do not feel I have to be angry at the same things other people are angry about. I see your point and I suggest a new strategy: let optimism win. That's why I'm embarking on a special journey in these coming months. Starting with this article, I am revisiting all the movies (not like I don't revisit them often anyway) with a particular look at what makes them fun. That fun includes scenes that are funny, of course, but more than that, too. Star Wars has a lot of humor and it pervades the entire saga. It makes the characters endearing and the scenes more down-to-earth. Fun also includes moments that just bring us joy. That joy may be from watching a character change or witnessing a perfectly laid-out scene. Whatever the case, let us remember the fun stuff. As we wait for the release of Episode IX, I'd like to look back at all the joy and fun the primary Star Wars saga brought us. From A New Hope all the way to The Last Jedi, this is my way of preparing for the end of the Skywalker story and the primary saga. So let's start where it all began: A New Hope. Rather than overwhelm you with my list of over 60 lines, moments, and scenes that I thought were funny or joyful, let's look at those that I think are most noteworthy and not often discussed. Star Wars begins seriously enough with Leia’s small ship enduring an attack from the Empire’s large destroyer. In one of the greatest opening scenes in movie history (which has been discussed enough to warrant the hyperbole) ,we empathize with the good guys right away. We root for the underdogs. The ship is getting decimated before being captured. Stormtroopers flood in and quickly subdue the rebels. Meanwhile, a couple of droids who are trying to get away from the battle suddenly find themselves in the middle of a crossfire. Because droids don’t quite have the logic of humans, C-3PO and R2-D2 decide to jaywalk across the corridor in a leisurely amble. Success is theirs when they reach the other side of the passage without a single hit from a laser beam. Impossible? No. Improbable? Yes. Funny? Undeniably. Was it luck? Was it fate? Or was it the combatants’ terrible aim? (Not just Stormtroopers, but Rebel blockade runners, too). C-3PO and R2-D2 stroll safely through the crossfire. © Lucasfilm. Sure, this was some silliness very early on in a Star Wars movie—but we already need some comic relief. People were getting mowed down by lasers left and right. This told us not to take all this too seriously. Why else put that shot in the beginning of the movie in the middle of a gun fight? It did not ruin the tone of the film, but helped set it instead: this movie is going to be fun. We see many of the movie’s events through the point of view of the droids. C-3PO is often bumbling through the events around him, a victim of circumstance, often lamenting his misfortune. We sympathize with him because suffering is often the basis of humor. 3PO’s reaction to the drama around him is usually fear, but his distress is amusing to us—not in a sick way like we enjoy misery, but because we know his role is a comedic one and therefore we know he will be alright. So, the more trouble he gets in, the funnier it’s going to be. That’s where R2 comes in. R2-D2 is more the straight man in this comedy duo. Where 3PO is scared, R2 is brave—but often to his own detriment. He’s plucky and ambitious, ready to get into the action. This drags 3PO along for the ride, but not without declaring time and again to his little friend know that he does not like it one bit. Even with that fear, 3PO will not abandon him because 3PO knows R2 needs him as much as he needs R2. The little one will just dash off into danger and 3PO will go, not because he wants to, but because R2 needs help regardless if either one will admit it or not. This relationship creates a fantastic dynamic. It isn’t just for comedic effect, but a portrayal of real friendship. They are better together than they are apart despite the fact they argue with each other like an old married couple. C-3PO and R2-D2, Star Wars' odd couple. © Lucasfilm. Some of the movie’s best exchanges of “dialog” are between the two droids. We never know R2’s true words, but we know enough from his emotive beeps and whistles and from 3PO’s reactions to discern his meaning. When R2 hobbles cutely into the escape pod, 3PO retorts, “Don’t you call me a mindless philosopher, you overweight glob of grease.” We love to hear them toss insults to each other; we take pleasure when obvious friends argue. For every, “nearsighted scrap pile,” and “malfunctioning little twerp,” we know they love each other. C-3PO has to wake up a sleeping R2-D2. © Lucasfilm. And later, 3PO admonishes R2 for his choice of words saying, “I don’t know what all this trouble is about but I’m sure it must be your fault.” R2 replies with what can be described as an electronic raspberry. “You watch your language!” It would not be the last time this little dynamo cursed along his way. He may simply have the mouth of a sailor and we have never known it. Regardless, it was Anthony Daniel’s amazing balancing act in portraying C-3PO that endeared both droids to us; he had to balance between android and human. Kenny Baker added that right slice of humanity into R2-D2 and gave the character that little bit of innocence we needed to see. It took both human actors to represent this duo with such humor and tenacity that we will always enjoy watching again and again. C-3PO tells R2-D2 to watch his language. © Lucasfilm. Before she even speaks a word, Princess Leia is busy getting things done. First, she is already racing aboard her starship, then hides the Death Star plans in R2, and narrowly avoids capture by shooting down a Stormtrooper. Our Princess follows through on this modus operandi when she faces Darth Vader. She wastes no time laying into him saying, “Only you could be so bold! The Imperial Senate will not sit still for this!” We just saw Vader choke a man to death with one hand and here’s this little woman escorted by armed guards (won’t be the last time), and she gets in the first words. Vader has to actually interrupt her to get her taken away. We see immediately that this dark imposing villain is not invincible and that this Princess is not taking any crap. So what happens when Leia faces the main officer (the “Moff”) on the Death Star? What do you think? She kicks things off by saying Grand Moff Tarkin holds Vader’s leash and says, “I recognized your foul stench when I was brought on board.” Like C-3PO, we would be afraid of being captured or melted down, but faced with this capture and torture, would we mouth off to the guy who will order your execution? Leia would. She’s just getting started. Leia can recognize corruption by its odor. © Lucasfilm. Like the droids, Princess Leia conveys irony. She is fairly small, beautiful, but unassuming in appearance. She stands up for herself and shows no fear. What we expect from her is not what we get. We get something greater: a fighting spirit. And a fighting spirit does not have time to waste with interrogations and pointless questions. The great thing for us is that the Princess lets us know just what she thinks about those around her. That even includes Luke. Stormtroopers have probably paid her several visits to her prison cell on behalf of Vader regarding the plans and the Rebel base. But here comes in another one which in her mind cannot be a good thing. But she gets in the first words again: “Aren’t you a little short for a Stormtrooper?” She is a classic. "Aren't you a little short for a Stormtrooper?" © Lucasfilm. Shortly after Luke gets her out of the detention block Leia finds her rescuers are under attack. Never one to hesitate from assessing a current situation’s flaw, she asks, “Didn’t you have a plan for getting out?” Not able to talk his way out of it, Han defers to Luke saying, “He’s the brains, sweetheart!” Not the ideal time to play the blame game, Leia realizes the exit strategy does not exist so she takes matters in her own hands. Princess Leia is not pleased that her rescuers cut off their only escape route. © Lucasfilm. Leis is also not pleased that her rescuers didn't have a plan for getting out. © Lucasfilm. From her time in the prison Leia was observant enough to know that there was a garbage chute’s vent near her cell door. Where else would the Empire design a garbage vent? Talk about torturing prisoners. With her quick-thinking, our heroes got out of the shootout. Although they were now in the belly of the beast, it at least gave them another chance to escape. Here is where they began working as a team. Luke contacted his droids to get them out of the trash compactor and Han, with Chewie, get them out of the Death Star. Leia realizes somebody has to save their skins. © Lucasfilm. That teamwork may not have begun in friendship, but that friendship did grow out of their common need to survive. After their escape from the junk room, Leia followed her instincts and took charge of the situation. She addresses Han, “From now on, you do as I tell you, 'K?” Han objects, of course, but Leia already declares her first order: “Would somebody get this big walking carpet out of my way!” Once again she is not afraid, and does not even back down from a beast that could rip people’s arms out. Even though we do not see Chewbacca’s reaction, I always figured in my mind that the wookie instantly loved her right then. Carrie Fisher brought Princess Leia’s quick-thinking, quick wit, and fearless disposition to life and imbued it with a hint of vulnerability that made us instantly love her, too. "Would somebody get this walking carpet outta my way?" © Lucasfilm. We like Han because he’s cool. He has a great ship, his sidekick is an intelligent bigfoot, and he is a salty character. As the story progresses, we learn more about him and that he has a good heart. He is a wonderful embodiment of what we love about Star Wars: adventure, humor, and more all wrapped up together. Luke, despite his inexperience in the galaxy and his naivety (or perhaps because of them), brings out the best in Han. Their plan to rescue Princess Leia is evidence of their growing friendship. They’ve decided to work together and so their experience and teamwork are put to the test. It does not begin well. In the elevator to the detention block, Han shares his doubts, “This is not going to work.” Luke replies, “Why didn’t you say so before?” And Han: “I did say so before.” Han is trying to toss the blame again because he will not admit mistakes. We realize his pride as a character and like C-3PO, we find his misfortune a bit funny; we know he will be alright, but we want to see how he will get out of a difficult situation. Han and Luke argue that their plan might not work. It kinda doesn't, but kinda does. © Lucasfilm. Han and Luke don't know which side of the elevator the door opens. Oops. © Lucasfilm. His actions humorously lead to even more difficult sitations. After their initial gun fight at the front of the prison tunnel, where most everything has been shot to pieces, Han responds to a call with, “Everything under control, situation normal.” We all remember this scene so well and it makes me laugh every time. After telling the concerned Imperial officer that it was a “slight weapons malfunction,” he continues trying to diffuse the trouble by saying, “We’re all fine here now. Thank you. How are you?” He winces in disbelief at what he just said. Han, in later stories, claims to be able to talk himself out of situations but the truth is evidenced here. He ends the call by destroying the communicator with a laser blast. The jig was already up. Although he failed to quell the trouble, he was so endearing we can’t help but root for him. "We're all fine here now. How are you?" Han can't believe what he just said. © Lucasfilm. Even when put out of danger thanks to Leia, he cannot relinquish his pride. Upon landing in the trash compactor he directs his frustrations right back at her saying, “What an incredible smell you’ve discovered!” And he continues to claim he is in charge with, “I had everything under control until you led us down here.” The irony oozes as much as the discarded Imperial coffee in the garbage room. Han "had everything under control." © Lucasfilm. "Could be worse ..." Han says, "It's worse." © Lucasfilm. Han is the type of guy who does not accept a no-win situation. His denial sometimes helps him find a way out. When he cannot find a way out his denial manifests in a quick verbal assessment of the situation. For example, when the walls are closing in on all of them and they cannot climb up or shoot down the door, he says, “One thing’s for sure. We’re all gonna be a lot thinner.” While this may not be an appropriate statement in such dire straits, it is entertaining to us. It is possible he accepts his fate, but it shows he will not give in to despair—and he does not want the others to give in either. Han says, "We're all gonna be a lot thinner." Not the best time for a joke, but maybe it is. © Lucasfilm. After their escape from the rubbish and are suddenly spotted by stormtroopers, we are treated to one of the more physically comedic moments in the movie. It borders on absurd humor which is probably why I love it so much. It does not make any sense, but it is so harebrained as to be delightful. In a move of sheer insanity, Han chases a unit of Stormtroopers down the hall on foot while screaming something like a war whoop. He has a devilish smile on his face like he knows they are scared and do not know what to do but run away. Unfortunately for Han, he turns the corner to find an entire company of stormtroopers turning to face the yelling fool. The funniest part comes when Han’s expression turns from menacing glee to one of abject shock and his warrior cry to one of pure fright. Harrison Ford really demonstrates all of Han Solo here. Han Solo finds a surprise while wildly chasing Stormtroopers. © Lucasfilm. Han severely outnumbered at the end of the hall. What was he truly expecting? © Lucasfilm. Stormtroopers try to capture the heroes by closing the blast door. © Lucasfilm. Quickly realizing their mistake, Stormtroopers try to open the blast door. © Lucasfilm. Chewbacca frightens a mouse droid away. © Lucasfilm. C-3PO's new strategy means Chewbacca wins. © Lucasfilm. Long Snoot appears. At first, he seems intimidating. © Lucasfilm. Long Snoot, not so intimidating after he squeaks into his comlink. © Lucasfilm. Leia is the mindful one and saves Luke. Luke then saves them both. © Lucasfilm. Infamous in its subtlety, the hapless Stormtrooper on the far right bumps his head on the door. There is more to this bump if you search the net. © Lucasfilm. I hope you enjoyed this look at the fun stuff. We'll continue this next month with The Empire Strikes Back and we will see just how humor manifests itself in what many consider the darkest chapter of the saga. Thanks for reading. What do you consider the funniest or most fun moments in A New Hope?